Y’all know I’m the drink girl, right? And y’all know that if I do show up with something delicious it probably came from Krogers? Well, this year my very best friend, Shelly, dropped a bomb on me. Shelly: If I give you a recipe, will you make it? Me: What? Of course not. Shelly: I just want you to make something instead of buying it. I think everyone has (or should have) that friend that has done everything in the world for you. Listened to you whine about boys. Created study groups so that you would have easier access to the cute guys in Calculus. Made sure you got to classes on time and didn’t forget about big exams. Makes sure your group from junior high still gets together on the regular. Walked through Babies R’ Us with you to register because you had no clue what you were doing. FOR OVER FIFTEEN YEARS. Shelly is that friend for me. So when she wanted me to cook something, doggone it, I was gonna cook something. I found this little gem on Pinterest on Friday and decided that this is what I’d bring to our Junior High Christmas Party. I was familiar with all of the ingredients and it didn’t require much more than putting everything in a skillet. I could totally handle this. I know all of you are like, “You had to go the store for that? That’s always on hand at my house.” Nope, the only thing we “always” have are bananas. And empty McDonald’s bags. That’s it. So I had to go to the store for all of it, plus a couple of other items Mark shouted at me as I drove off. Merging my written list with Mark’s verbal list really threw me for a loop. I walked around aimlessly like someone who goes to a grocery store only for bananas might do. First the dairy aisle, then the vegetables. Oops forgot something from the dairy side! I probably walk a mile per item when I go grocery shopping which is why I only get bananas, which are (usually) right next to the door. I finally get to the register and pay. The minute I touch the parking lot I realize that I forgot something. I forgot corn. 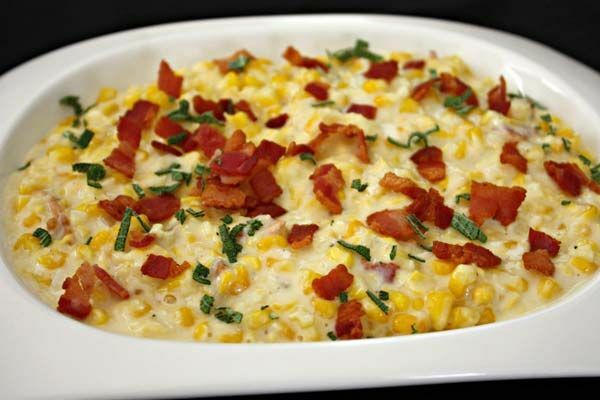 In a recipe called Bacon Cream Corn. I put my groceries in the car, ran back in, and bought the corn. Thank goodness I realized it before I got home, right? I get home and have to immediately start cooking because I’m late because I’m, well, me. I forgot to buy cream cheese. I told my mom this story yesterday and this is the point where she started twitching, too. Me: Mark, finish cooking this bacon. I need to go back to the store. I forgot cream cheese. Mark: What is this for? Are you making dinner? Me: No, I’m going to that party. Mark: You’re bringing something? To a party? To eat? Me: Quit asking questions and watch my bacon. Bye. I run into Kroger’s to find the cream cheese, and dash back to the self-checkout register to pay. This is the point in the story is when my mom just started silently sobbing. I’d left my wallet… somewhere. But I had a checkbook! Can I write a check for a $2 package of cream cheese that the rest of America just “keeps on hand”? Nope. I needed a driver’s license to do that. As I put the cream cheese back, I can honestly tell you that I’ve never, in my entire life, wanted to steal something so bad. Just drop that little box right into my over sized purse. The temptation was so strong that I still want to steal it. I went back to the car and found my wallet. Thank, God. Once I finally got home, we threw all of the ingredients into the skillet and prayed that it was worth it. And it totally was! It’s a delicious and simple recipe that I’d highly suggest you try. I even had to tell Mark to quit taste-testing it because I wasn’t going to have spent the last 2 hours of my life in Kroger’s to bring a half eaten dish. Go get yourself a banana, Man. In the end, I hope this sufficiently explains why I’m the drink girl. Forever and ever. Amen. Love you so much and appreciate greatly that you tried (and were immensely successful). And this blog post totally makes it worth it. You can go back to being the drink girl if you want, or you could become the Bacon Cream Corn girl.